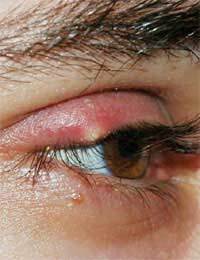 A stye of the eye can develop as tiny glands in the edges of the eyelids known as sebaceous glands become infected. It commonly affects children but can develop in anyone of any age. What Causes Styes to Develop? A stye can be an effect of blepharitis (inflammation of the eyelid edges) and can develop a stye inflammation extends to become an infection. It can also occur if an oil gland around the same area has become blocked causing fluid to build up and an infection has developed. The infection responsible for styes is most commonly caused by the staphylococcal bacteria which is more commonly found in the nasal cavity, so these germs can be easily transferred to the eyes by simply wiping the nose then rubbing the eyes.Many experts agree that stress, hydration and nutrition can also be contributing factors to their occurrence. Initially, a stye may appear as a small red area to the edge of the eyelid. This will often continue to grow until a small lump has formed. The skin will appear red, inflamed and can become quite taut and shiny in appearance. The skin may appear irritated. As the stye grows in size and the infection develops, pain and discomfort are often experienced also. Sight should become compromised, although if the stye is particularly large, it may become more difficult to open the eyelid fully. Cleansing the eye regularly using a soaked flannel or cotton pad will help to remove some of the build up of pus, particularly if warm water is used as this will encourage pus and fluids deeper in the tissue to be drawn out. Cool compresses and pain relief may be beneficial before and after cleansing if discomfort levels are high. As a stye is caused by a bacterial infection, it is often necessary to treat the problem using anti-biotic therapy. This can be prescribed by your GP, and will often come in the form of an eye ointment that can be applied at home. It should be noted however, that most styes will heal on their own, especially if plenty of water and fresh fruit and vegetables are consumed in the diet. It is essential that hands are washed and dried before and after application of the ointment to prevent the infection from worsening or spreading to other parts of the body. Do not be tempted to try and burst the stye as this can be very painful and cause further infections to develop. As the bacteria causing germs are found in the nose, styes can sometimes be prevented if care hand hygiene rules are practised, especially regarding the insertion and removal of contact lenses and eye make-up. Hygiene guidelines should also be more strictly followed in the presence of a head cold, and by not sharing flannels, make-up application utensils and eye wear. Styes are very common and usually not serious complaints that come and go on their own. It is often not necessary to seek any professional help unless symptoms persist or recurrences are very frequent. An informative and practical site. Realistic advice and reassurance.